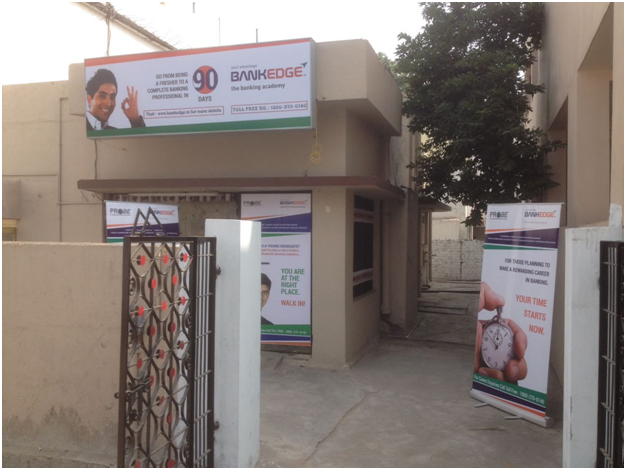 BANKEDGE, an Academy of Banking & Finance, today unveiled its Flagship Training Centre at Raipur, Chattisgarh. With State-of-Art infrastructure and Audi Visual training facility, Centre will offer training programs in Banking and Finance Sector. These programs will be backed by revolutionary Cloud Technology to ensure anytime anywhere accessibility. The smart and vibrant BANKEDGE’s center at Raipur is the first step in a series of changes that the company will now witness owing to skill development Program that makes the Young Graduates employable in the tier 2/tier 3 cities also. Spread across 1200 sqft, the Centre can enrol 100 students at one time. For the first time ever, young professionals and students will have the Opportunity to enter the Premium Banking and Non-Banking Firms through the available new-age career programs, aligned to the evolving needs of the knowledge economy. The banking sector may create up to 20 lakh new jobs in the next 5-10 years, supported by issuance of new licenses and efforts being made by the RBI and the Government to expand financial services into rural areas, according to experts. As per the discussion with major Private Banks, BANKEDGE – India’s Leading Banking Training Service provider forecasts that banking sector will generate 7-10 lakh jobs in the coming decade and the sector would be the among top job creators in 2017-18. Besides direct hiring, expansion in banking sector also helps in huge job creation in various support areas, BANKEDGE predicts. “The hiring scenario in the banking sector is extremely positive this year and is likely to be 80,000 to one lakh jobs, which is 25-30 per cent more than last year,” BANKEDGE CEO Santosh Joshi Said. This sudden in hiring is mainly on account of both PSU and private lenders becoming bullish on branch and portfolio expansion, besides retirement and attrition factors. The Reserve Bank of India, on the other hand, has announced about giving license to new banks to operate by the end of FY 2016-17. Another major reason behind hiring is the PSU banks adding more than 8,000 branches in the current fiscal year, also private banks, rural banks and foreign banks are expanding their own branch network that will boost job opportunities in banking sector. “With new banks being set up in Tier 2, 3 and 4 cities, there will be growing demand for business correspondents, sales executives and other banking professionals to reach out to the rural population. In the months to come, we expect to see higher hiring momentum in tier 2 and 3 cities to begin with. Most of our partner banks have seen their per employee productivity going up and attrition coming down through a conscious effort of hiring from tier 2 and 3 towns. New banks will require staff for branches, as well as for functions such as operations, IT, risk management, compliance, among others. Existing banks will specifically need candidates in the client-facing and client-servicing roles. The new licensees will hire people with banking expertise for key positions, thereby triggering a revival in recruitment for banking” Joshisaid. Prachi holds a degree in Journalism and carries with her rich & diverse experience of editing and blog writing. With a zeal to cater the surging need of skilled manpower into banking & NBFC sector she has set up this initiative of BANKEDGE at Raipur. The center inauguration was witnessed and graced by the presence of the veterans in Financial and Media sectors. They welcomed and wished the Business Partner for this venture and assured the required support to help young Graduates in building the successful career in financial sector. BANKEDGE, the banking academy is an experienced, professionally managed, career training company. We are active business participants in India’s banking and financial services domain, by virtue of our expertise in providing modern, highly relevant and technology driven training and learning for fresh graduates who aspire to make a career in banking. We are a team of serious minded, committed, intelligent and tech savvy professionals, who see unlimited career potential in India’s banking and financial services sector. Our core objective is to facilitate and ease the entry of every aspiring banker into this vertical, by offering a strategic mix of exclusive eLearning plus the direct impact of classroom sessions. PLUS TRADITIONALLY TESTED LEARNING MODELS. BANKEDGE is a valued partner to major private banks and important financial institutions, in their quest for recruiting personnel across nearly every entry level position. By studying them closely, we have come to understand their diverse functions and the quality of human assets needed to deliver a particular function. It is this insight that we leverage during our training and this is what makes us a distinct and preferred choice during recruitment cycles. When you entrust your career to us, we are fully aware of the responsibility and the expectations that you and your parents have from us. We therefore ensure that you are professionally counseled prior to admission and during your learning period with us we continuously strive to keep our curriculum updated and relevant to real life banking environment. We have built up a repository of experience, expertise and excellence over the years in this specialized domain and this we open up for you to access and learn from, on the way to building a career of your choice in the exciting world of banking. Does Bankedge give provide placements in Private Banks after course? Do they take 100% placement guarantee after that training? As is clearly clarified through our portals and other portals, we extend assistance to the students in placement either in a Bank or a Financial institution. Interview opportunities are provided in graded Private Sector Banks. A studious person with utmost devotion and attention to our knowledge transfer programs and assessment tests and mock interviews, will crack the interview without any difficulty.